Summer days behind us, we’re welcoming the cooler weather and shorter days with all things s’mores, cider and hibernation related. In an effort to embrace the coziness of fall and the coming winter months, we’ve gathered up some of our favorite fireplaces to sit by with a good book and a big glass of wine. 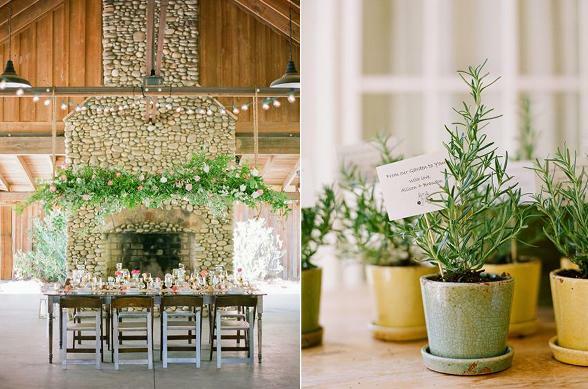 And bonus points: this list also includes noteworthy fireplace backdrop options for winter weddings. 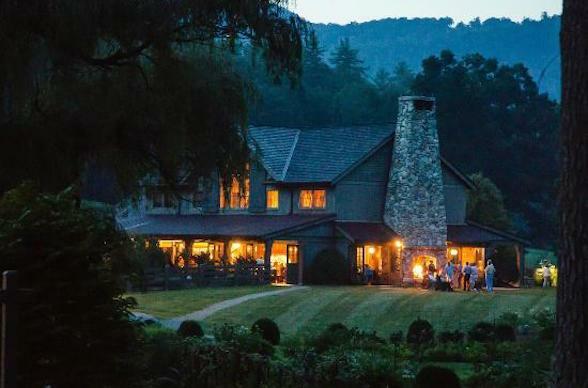 Looking to get married in a big sprawling field in the Catskills? This place might be your jam. The property boasts a 235 year-old barn and a sweet little 19th century farmhouse. Events come complete with a bonfire master. 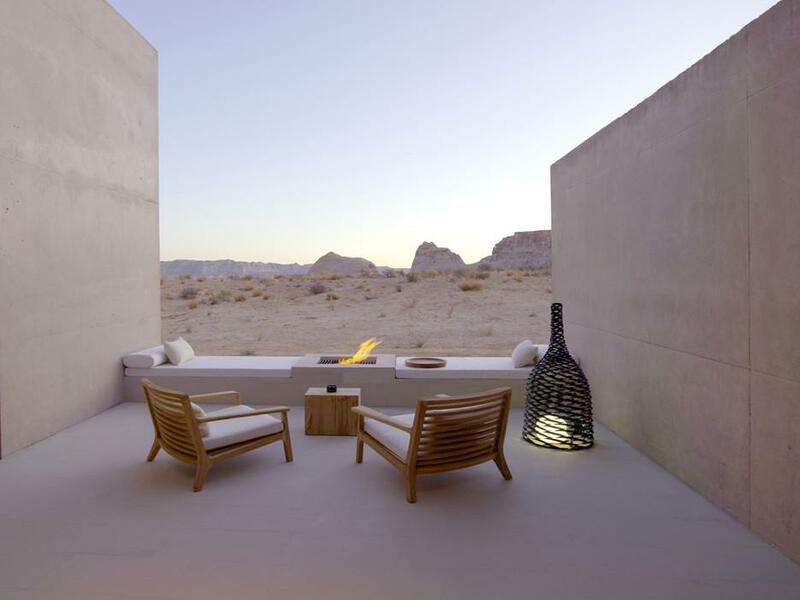 Every suite at this remote hideaway has an outdoor lounge and fireplace with expansive desert views. Tucked within the luminous canyons of the American Southwest you will be able to cozy up while nestled in a sweepign valley. Does life get any better than staying in a cabin in the woods with your very own in-room fireplace, a giant bathtub, and breakfast in bed on the daily? Expect an epic breakfast box delivered each morning with the newspaper. Lest we forget to mention, there’s a photo-worthy fireplace in the main event space too. 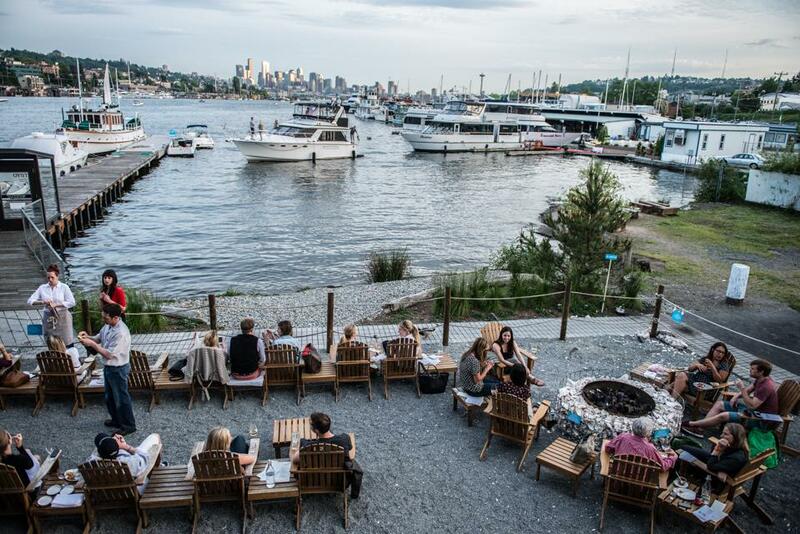 This waterfront bar and restaurant splits space between the indoors and outdoors, with a monster patio chock full of Adirondack chairs and firepits. It’s the perfect place to get that beach bonfire feeling without the swimsuit. If you haven’t heard of The High Line by now, it’s time to put this hotel on your NYC radar. 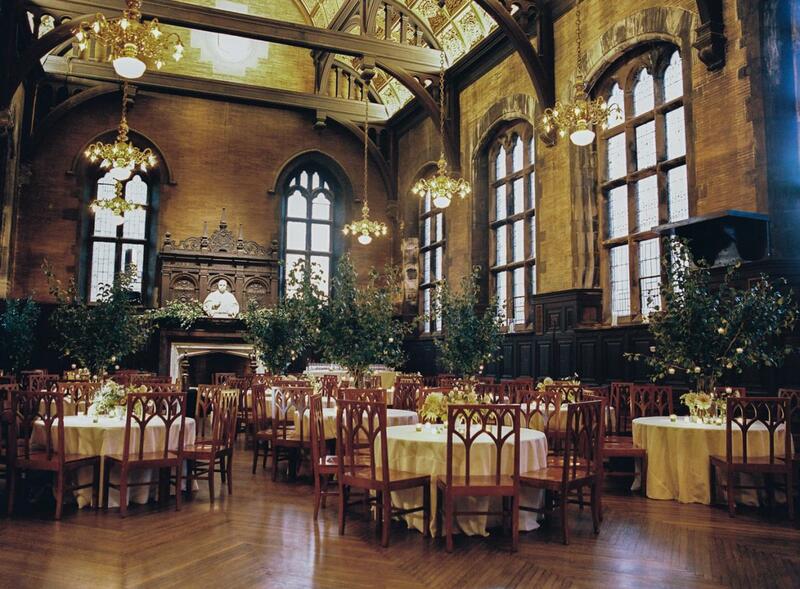 The hotel’s event space is this gorgeous Gothic room with cathedral ceilings and towering windows. Flanking the end of the room is a grandiose mantelpiece and wood-burning fireplace that adds just a touch more drama to the already spectacular room. 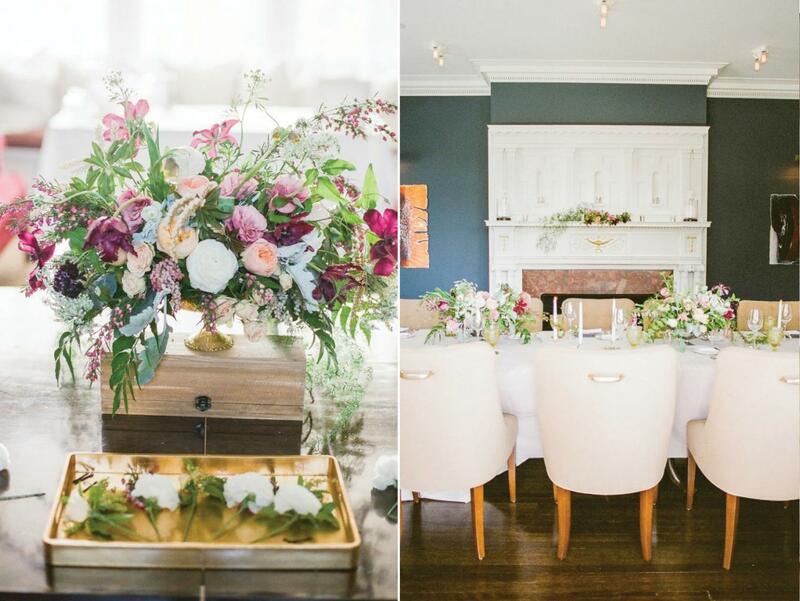 Centrally located in Orange County, The Colony House is a large craftsmen style venue with multiple indoor and outdoor spaces. The porch, connected to the main event space, is complete with a living wall and big brick fireplace that’s easily the best spot in the house on a cool evening. Saddle on up to this 60 square-mile ranch in Montana to see the woods, rivers and mountains, glamp in a canvas luxury tent, rent a luxury vacay home, snow sled, ice skate, cross-country ski, go fly fishing – wait, we’re getting carried away. Yes, they have firepits and fireplaces all over this property, and yes, we dare you to get bored here. After a long day of skiiing on the slopes, cozy up to the fire with a Hot Toddy at super ski chic Hotel Jerome. With gathering spaces galore, this boutique hotel is awaiting your group getaway or intimate snow-filled event with a giant fireplace as the centerpiece in the Lobby. However, our fave fireplace is located in 'The Living Room', an Aspen lounge with an array of seating options allows for intimate duos and groups to gather in comfort, and of course style. 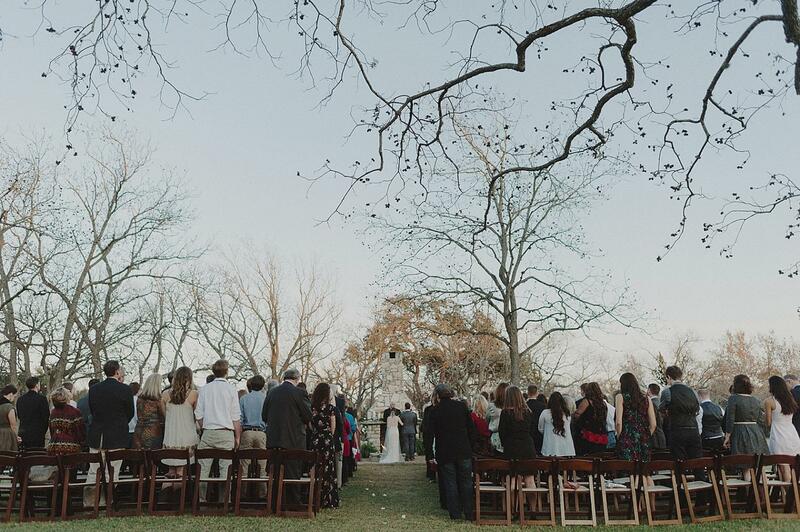 This Texas-sized ranch boasts plenty of outdoor space for events and parties of up to 700 guests. There’s a beautiful little 19th century fireplace out in one of the open fields and it’s a gorgeous backdrop for a wedding ceremony or outdoor lounge zone. 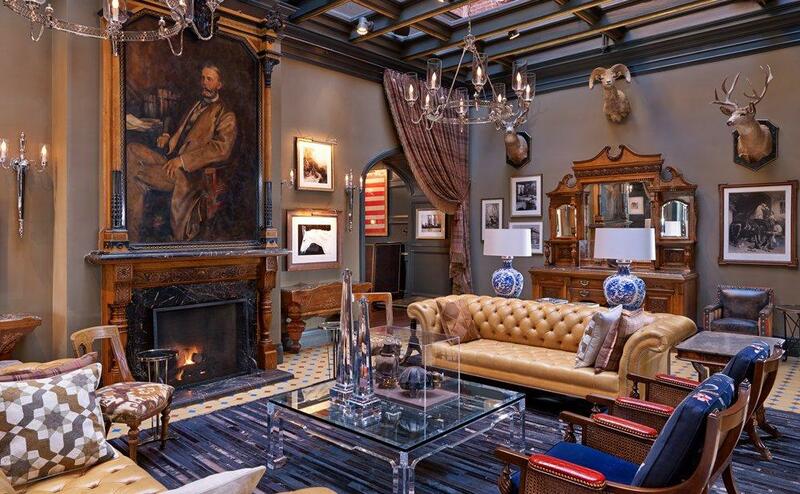 If ever you imagined a Restoration Hardware catalog photoshoot to take place in the Wild West, this would be the place to make that dream a reality. 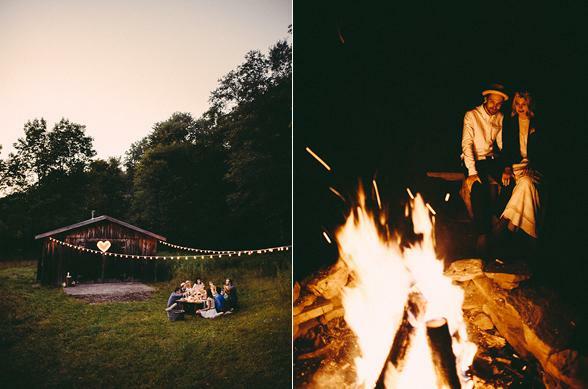 Everywhere you turn, there’s a stunning backdrop and the rustic-meets-luxury decor combo is spot-on. Fireplaces run in abundance here, as this property is the winter dream destination for those who love being out in the cold and those who love to stay inside while snow covers the mountainside. Love love love the design combo of preppy meets modern at this Western Massachusetts Inn and Estate. Every Thursday night in the fall season, the hotel has a brew and bonfire night! Also, a word to the wise fireplace seeker: The private dining room is CENTERED around an old fireplace and Room 204 has a working fireplace in the bathroom. We’ll stop while we’re ahead on this one. This sweet little boutique hotel in Big Sur is a mid-century modern design lover’s dream. What we love about Big Sur is that there’s all this beautiful fog that rolls in from the ocean in the evening and it usually sticks around until mid-morning. 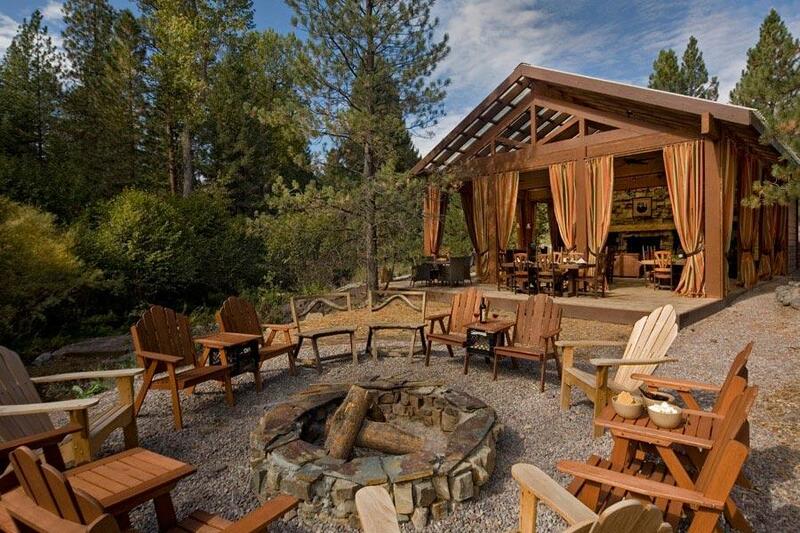 To keep things cozy around Glen Oaks, there’s a firepit outside their Big Sur Roadhouse restaurant. Oh, and all the rooms have heated floors and their own gas fireplaces. 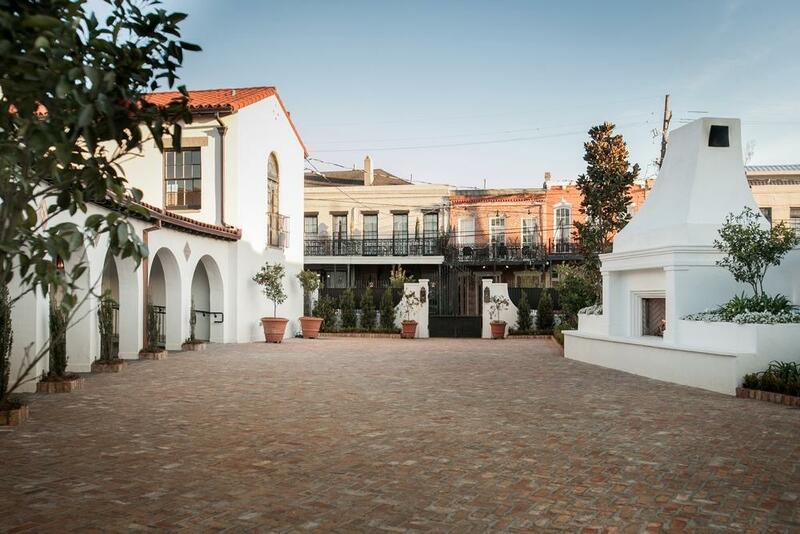 An old marketplace recently transformed into an event venue in the historic Lower Garden District of New Orleans, Il Mercato has the best courtyard for a fireplace hangout. 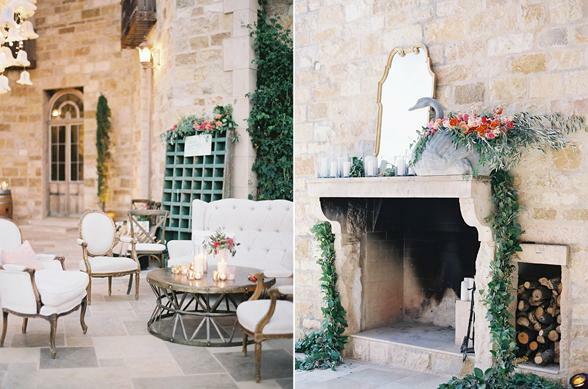 Many couples opt to use the Spanish-style white adobe fireplace as a wedding ceremony backdrop and then flip it into a hangout lounge zone after the ceremony. Put your pencils down and head to Washington School House . 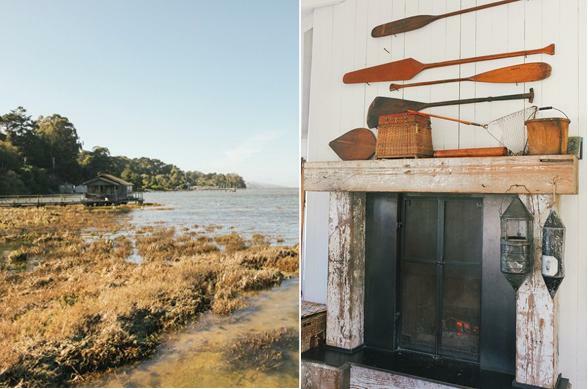 This restored historic building is a designers dream. Walk through the doors to find the chicest living room and fireplace in the area, or opt to gather round the outdoor bonfire pit with snow capped mountains in the backdrop. 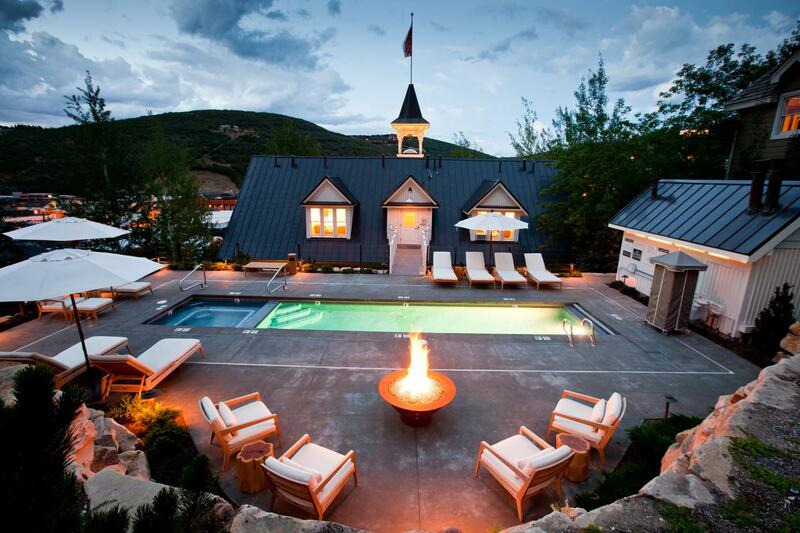 Rent the schoolhouse for a private gathering or the ultimate ski-filled group getaway. 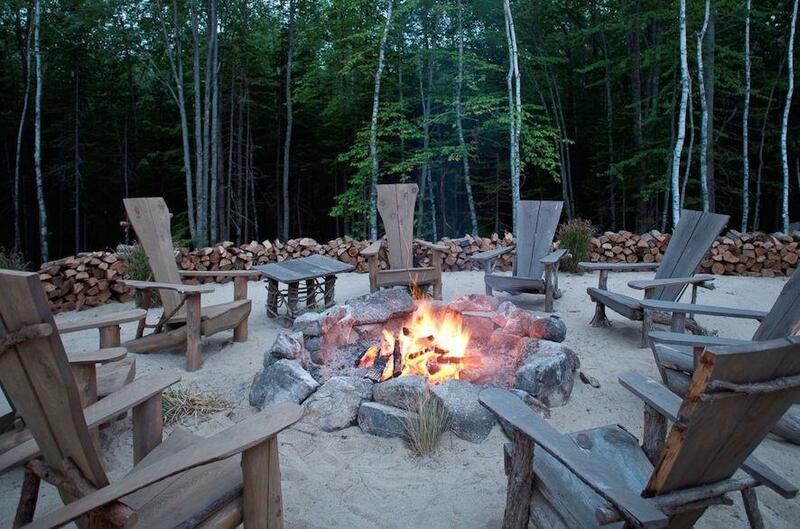 Indoor fireplaces combined with an outdoor bonfire pit located right next to comfy daybeds, make this Maine resort the perfect spot to sip hard cider this Fall. Seemingly ripped right out of a Restoration Hardware catalog, Hidden Pond is a great Fall group getaway destination. Set in the heart of Santa Barbara, this winery is also home to a villa with imported limestone from a small village in France. Wood beams reclaimed from a 19th century lavender factory hover over a courtyard with a soaring fireplace as the centerpiece. Perfect for warming up with wine during a winery tour or private gathering on the sweeping estate. There’s nothing lonesome about this setting, so long as you bring along some of your peeps for a getaway, retreat, wedding or anniversary. And if travel solo you must, the James Beard award-winning chef will certainly help you eat your blues away. 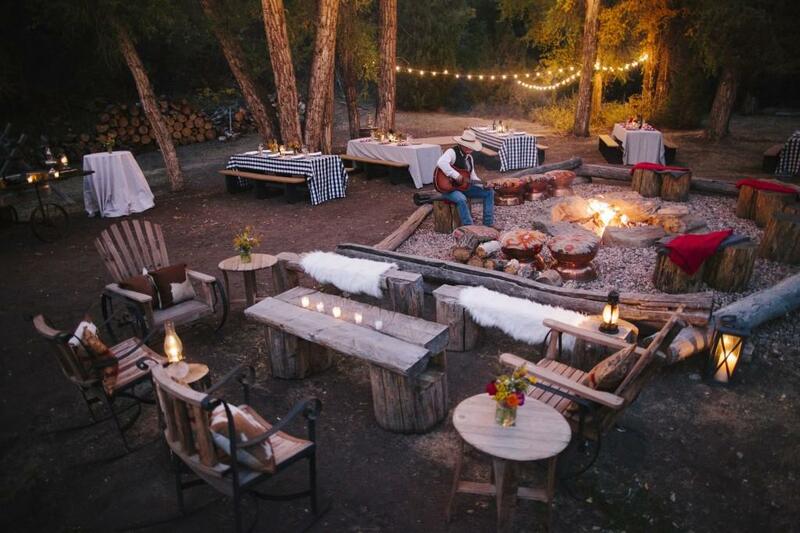 The event spaces are pretty rad and the big party barn includes stone fireplaces, exposed wood beam ceilings, giant windows, and indoor/outdoor space so you can add fire to your flame inside or out. 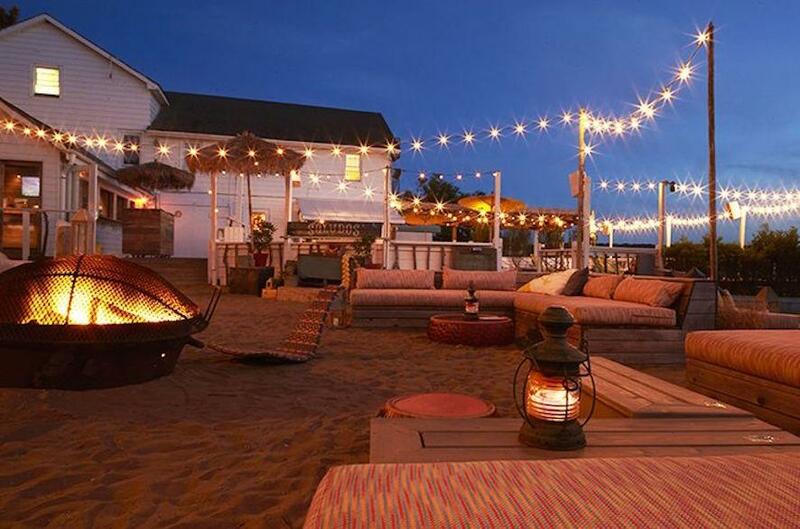 With its true bohemian sophistication, The Surf Lodge has paid meticulous attention to every detail, presenting an ambience that encapsulates the Montauk spirit. Gather round the fire for a bonfire on the beach, but make sure to snag your Pendleton blankets for the cooler Fall months! 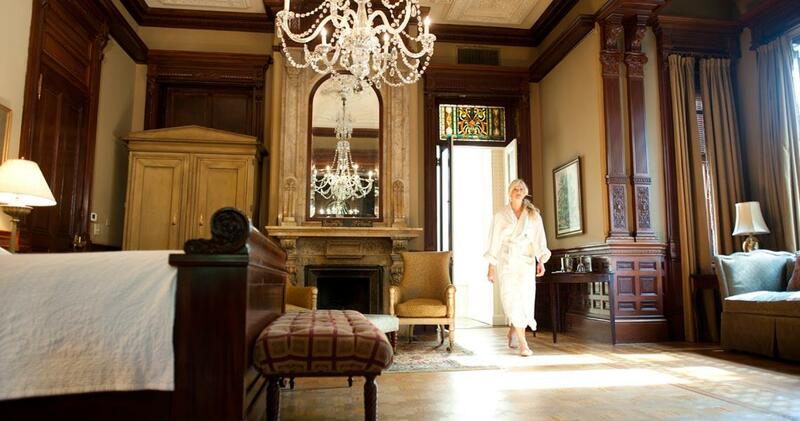 This mega-mansion, built in 1886, sits right in Downtown Charleston. 21 rooms, multiple small event spaces, and a restaurant keep this charming historic inn busy year-round. For those looking to pop in for an evening cocktail, there’s a lovely bar in the hotel that has an original stone fireplace. You will also be able to cozy up to a fireplace in your robe.. because you will find fireplaces in some of the rooms! 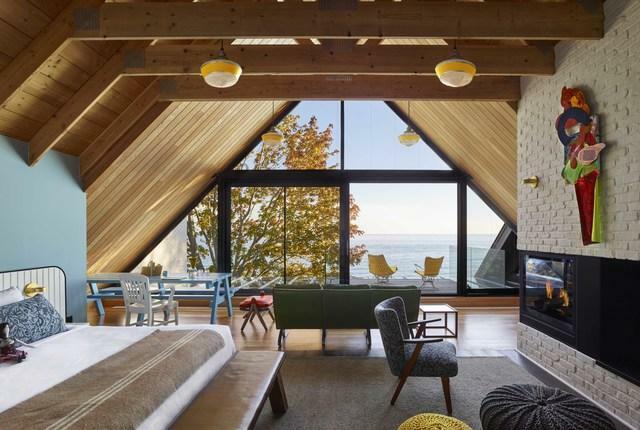 The Drake Devonshire is one of the most interesting contemporary hotels we’ve seen in a while. It’s kind of like if your super cool hipster friends joined forces with your besties from sleepaway camp and opened an art-filled modern boutique hotel and restaurant. 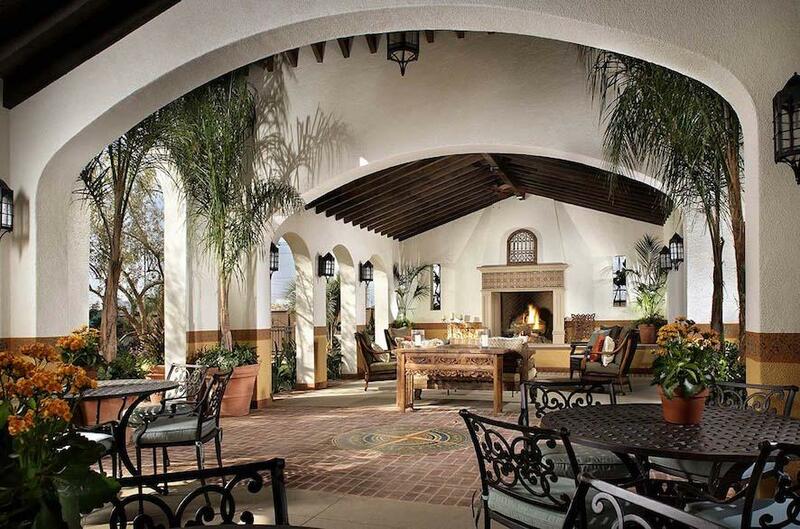 So, yeah, of course they have outdoor firepits in common areas and indoor fireplaces too. Behold, the mightiest of fireplaces on this list: the Dover Hall hand-carved stone lion head mantle piece. It’s giant, bold and beautiful, much like the rest of the English Tudor style estate it belongs to. 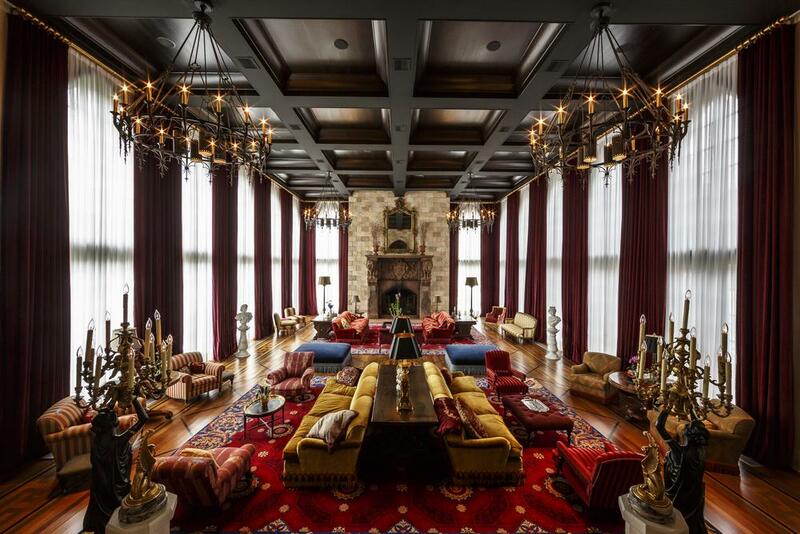 Complete with a ballroom, solarium, library, and 30 guest rooms, this 33,000 square foot mansion is pure old-world magic. 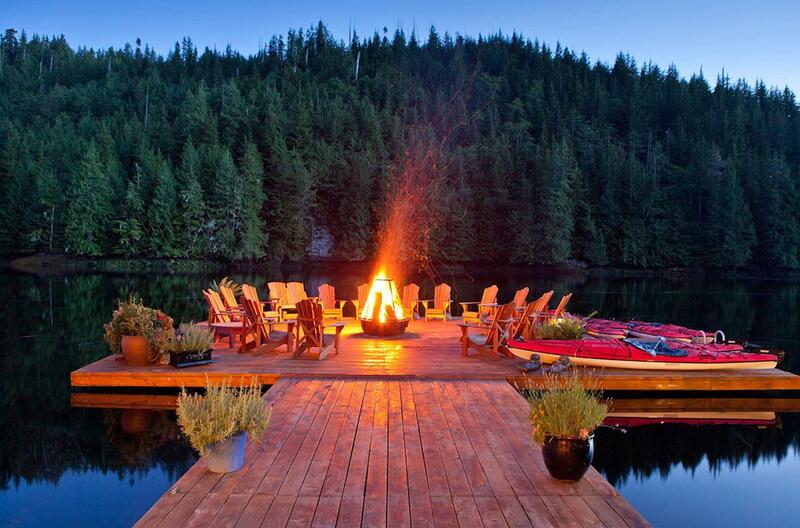 A gorgeous gathering spot on it's own - this luxury wilderness retreat in beautiful British Columbia is a winning and wild combination everything opulent and outdoor. 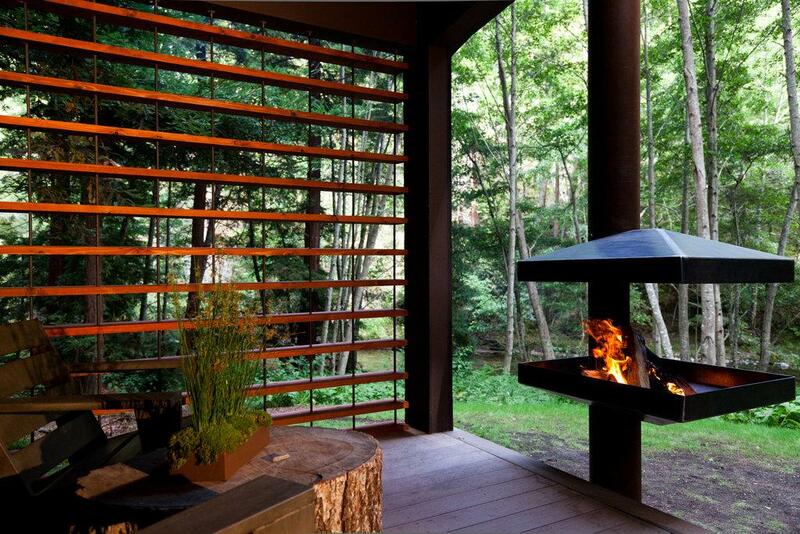 But the piece de resistence is this floating fire pit, simply superb for cuddling up across any season!